The influenza virus particle is made up of the viral RNA genome wrapped in a lipid membrane (illustrated). The membrane, or envelope, contains three different kinds of viral proteins. The hemagglutinin molecule (HA, blue) attaches to cell receptors and initiates the process of virus entry into cells. I have written about the HA and its function during infection (article one and two) but not about the neuraminidase (NA, red) or M2 (purple) proteins. Let’s first tackle NA. An important function of the NA protein is to remove sialic acid from glycoproteins. Sialic acid is present on many cell surface proteins as well as on the viral glycoproteins; it is the cell receptor to which influenza virus attaches via the HA protein. The sialic acids on the HA and NA are removed as the proteins move to the cell surface through the secretory pathway. Newly released virus particles can still potentially aggregate by binding of an HA to sialic acid present on the cell surface. Years ago Peter Palese showed that influenza virus forms aggregates at the cell surface when the viral neuraminidase is inactivated. The NA is therefore an enzyme that is essential for release of progeny virus particles from the surface of an infected cell. The NA protein also functions during entry of virus into the respiratory tract. The epithelial cells of the respiratory tract are bathed in mucus, a complex protective coating that contains many sialic acid-containing glycoproteins. When influenza virions enter the respiratory tract, they are trapped in mucus where they bind sialic acids. This interaction would prevent the viruses from binding to a susceptible cell were it not for the action of the NA protein which cleaves sialic acids from glycoproteins. When the virus particle encounters a cell, it binds the sialic acid-containing receptor and is rapidly taken into the cell before the NA protein can cleave the carbohydrate from the cell surface. The essential nature of the NA for virus production has been exploited to develop new drugs designed to inhibit viral release. Both Tamiflu (Oseltamivir) and Relenza (Zanamivir) are structural mimics of sialic acid that bind tightly in the active site of the NA enzyme. When bound to drug, the NA cannot remove sialic acids from the cell surface, and consequently newly synthesized virus remains immobilized. The result is an inhibition of virus infection because virions cannot spread from one cell to another. 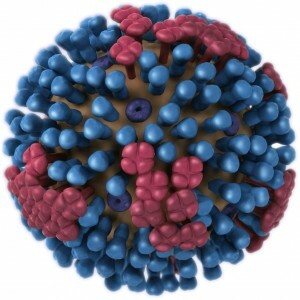 This article is part of Influenza 101, a series of posts about influenza virus biology and pathogenesis.